The optional Air Jacket pictured here fits either the Hyfire I or the Hyfire II. This unit can be piped directly into your existing hot air system. A great supplemental heating source will cut into those high heating bills. The Hyfire jacket does not come with filters or a cold air return. Along with this stove option, there are other options mentioned in the descriptions of the other stoves in this brochure. Many of these can be added to any stove. 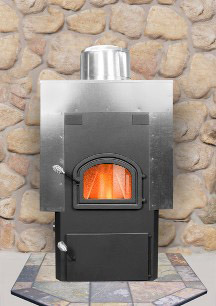 If you have ideas or questions regarding the customization of your Leisure Line Stove, please ask!